Tap the objects and find the hidden items to figure out the puzzles using your brain (or visit SolvedApp.com we make it easier). Open all the doors and Escape from the house! Is that simple! but it get’s harder with each level of Can You Escape The 100 Room 3 so don’t panic if you get stuck in a level come visit our walkthroughs for each specific level. If you are looking for the answers to Can You Escape The 100 Room 3 level walkthrough, cheats and solutions here at SolvedApp we bring you the Can You Escape The 100 Room 3 help you need to get through every level. 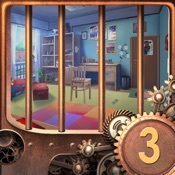 Can You Escape The 100 Room 3 is among the most popular room escape game & apps. If you haven’t tried it yet, it’s highly recommended by us. Nuff said this is among our favorites apps for Android & iPhone! Hope you enjoy it! and don’t forget to share. Enjoy!